In its seemingly insatiable hunger, the black hole gobbles up more and more of the space around it, devouring a Sun’s worth of mass every two days. 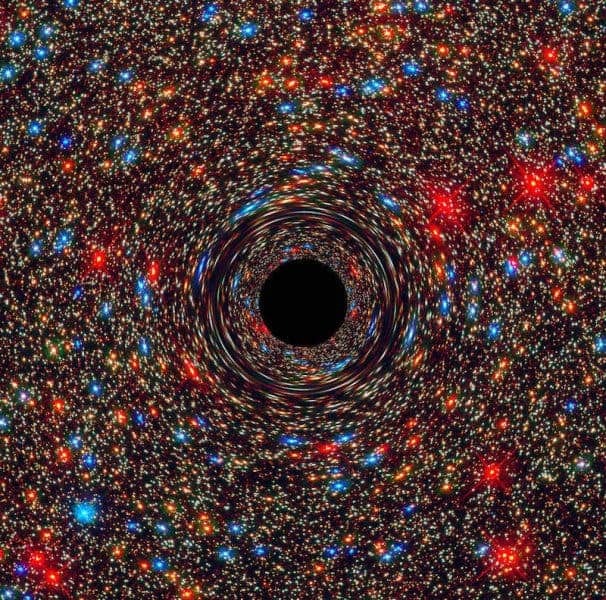 Computer-simulated image of the black hole. Image credits: NASA, ESA, and D. Coe, J. Anderson, and R. van der Marel (STScI). Black holes are the most massively dense objects we know of in the universe. They range from about 5 solar masses to billions of solar masses, in the case of the supermassive black holes found at the center of most galaxies. Because they’re so massive, black holes draw surrounding objects closer and closer to them, until they essentially gobble them up. So far, nothing new — black holes are massive, and they have the appetite to go with it. But this new black hole is voracious beyond anything we’ve ever seen, and no one really knows why. We’re actually really lucky this object isn’t any closer to us. The energy it emits is mostly ultraviolet light, but the object also radiates vast amounts of X-rays, which would probably kill all life on Earth, Wolf says. Artistic depiction of how a very distant quasar powered by a black hole with a mass two billion times that of the Sun may have looked like. Image credits: ESO/M. Kornmesser. The black hole in case is a so-called quasar: an extremely bright active galactic nucleus which emits energy throughout the entire spectrum — at radio, infrared, visible, ultraviolet, and X-ray wavelengths. 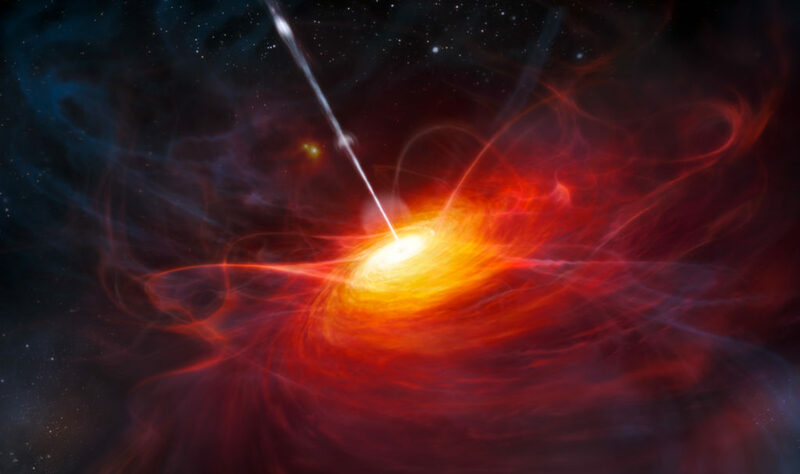 This particular quasar was discovered by analyzing light in the infrared range of the spectrum — through the so-called redshift effect. Redshift takes place when light or other electromagnetic radiation from an object is increased in wavelength, which in this case occurs because the universe is expanding, and the black hole is far enough to make this effect noticeable. Interestingly, this type of object can also be used to study other things — because it’s so luminous, it shines a lot of light on its surroundings. As Wolf himself says, the object is so massive it makes the universe more transparent, and easy to study. The object’s existence was already confirmed. These rapidly-growing black holes are extremely rare, and Wolf has been looking for them for months. Now, he is already looking for even hungrier ones.